British Rail’s rail blue corporate identity was one of the most successful applied to any British transport company in the 20th Century, but by the late 1980s it had been all but wiped out. The story of its decline and fall is directly and inversely related to the rising confidence of British Rail and its operating sectors themselves. Its success, in essence, became its undoing. If asked to recall British Rail as a nationalised operator, most British people will eventually describe blue and grey trains, and the double arrow logo, all part of the rail-blue corporate identity developed by Design Research Unit in the mid-1960s, as we saw last week. So strongly did that corporate identity imprint into the national consciousness that it has over-written the earlier corporate identities used by British Railways (which we looked at here), and remains more memorable than many of the later British Rail corporate identities for its subsidiary business sectors, and many of the post-privatisation corporate identities developed for train operators. Perhaps the zenith of British Rail’s corporate identity was on its fleet of High Speed Trains, introduced from 1976. With their wedge-shaped ends, the InterCity 125s were the product British Rail’s corporate identity could have been made for. They remain one of just a handful of transport vehicles which have become icons in their own right, recognisable outside the transport cognoscenti. The sharp angles of the double arrow logo perfectly complemented the raked ends of the InterCity 125, and the look was enhanced by extending the safety-yellow front end back along the bodyside in a stripe which ended at an angle matching the nosecone of the train. By putting it on the path to profitability, this was the train that saved British Rail’s InterCity business, and probably, by extension, British Rail itself. Beeching might have wanted British Rail to look modern with its new corporate image, but it took until the InterCity 125 before it had a truly modern train to match. It transformed British Rail’s image almost instantly. Suddenly, instead of a distress purchase, intercity train travel was an attractive alternative to driving a car. Thanks to their modern image, and a top speed of some 15-25mph faster than previous express trains, allowing journey times to be slashed, the InterCity 125s created substantial passenger growth. This was a virtually unheard-of concept on British Rail at the time, with large main line electrification schemes the only other projects which had delivered sizeable boosts in patronage. The joy of the Intercity 125 for British Rail was that it was diesel powered, so it could be widely deployed. This was very useful given that electrification was proceeding at a snail’s pace, if indeed even that fast. Before long the InterCity 125s were operating from London to Wales, the west country, the north east and the Pennines. Much of the rest of British Rail’s network might still have been slow, draughty and generally uncomfortable, not to mention clearly lacking in investment (as anyone who caught an old, rattling, diesel train at a slowly decaying station in the so-called ‘Provincial’ service areas could tell you) but the InterCity 125s defined British Rail’s public image and for the first time gave it real confidence going forward. British Railways’ 1950s and 1960s lions and wheel heraldic emblems, regional variations, and steam train-inspired carriage colours exemplified its muddled thinking and failure to get to grips with the post-war world. By the late 1970s, British Rail’s double-arrow-blue-and-grey corporate identity summed it up, too. This was a cohesive company with a good degree of confidence about what it was doing, certainly in its InterCity business. The corporate identity was unfussy, almost stark, and that was British Rail too. It would get you to where you were going, most of the time anyway. But it wasn’t exactly seductive or luxurious. The preponderance of dark blue on the outside of trains, melamine fittings inside, and the acres of dark-coloured polyester uniforms sported by staff, saw to that. That, however, was almost the point. British Rail was still living down the financial fiasco of the Modernisation Plan, and was trying to present a sober, financially responsible image, at which it was beginning to succeed. The catering was dire (I know it became a standing joke, but unless you were in the restaurant car of an InterCity train it was, it truly was), customer service was rarely better than poor-to-average, and there was never enough capacity on busy commuter routes because the government hated giving British Rail any money in case it wasted it (hence also the slow progress on electrification), but British Rail and its corporate identity were rapidly gaining in confidence. In 1978 the first major revision to the corporate image was unveiled, when locomotives began receiving the “large logo” version of the British Rail livery. This featured a full height version of the double arrow logo. Suddenly, British Rail had become proud enough of itself that it wanted to emblazon the logo which represented the company as large as it possibly could. Yet this was the rail blue corporate identity’s last hurrah. In the same year, InterCity’s prototype Advanced Passenger Trains (APTs) entered service. 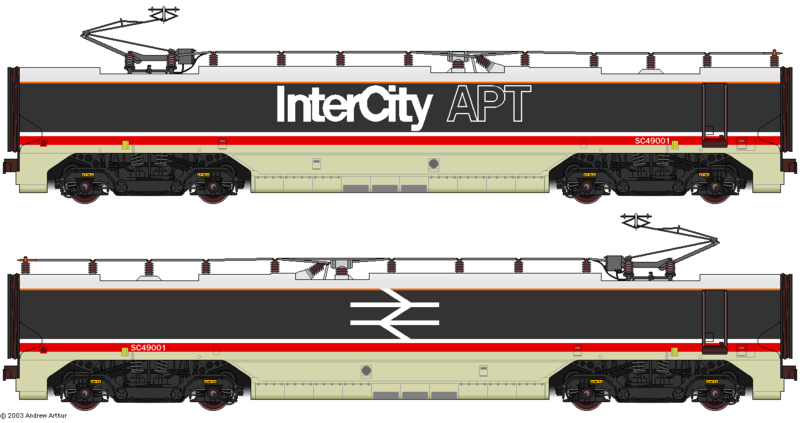 Thanks to InterCity’s success with the InterCity 125 (even though the design teams of the two trains were rivals) it was in a strong enough position to demand that the Advanced Passenger Trains break away from the long-established rail blue corporate identity and sport a brand new livery of dark and light grey, separated by red and white stripes. It was a complete departure from rail blue and grey, although (for now) the double arrow logo was retained in the design. There had actually been variations to the standard British Rail corporate image from the beginning. Pullman coaches wore a reversed version of the blue and grey colours (grey bodies, blue around the windows), a smart colour scheme also employed later on the prototype High Speed Train and the experimental APT (not to be confused with the later prototype APTs referred to above). 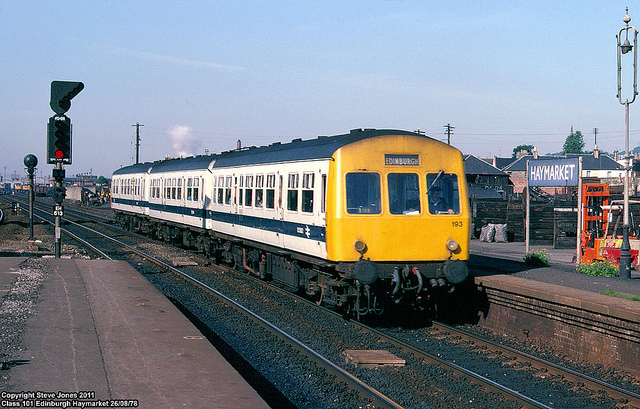 From the mid-1970s, refurbished diesel trains on provincial services had been painted white with a rail blue stripe. In fact this was a particularly stupid colour scheme given that diesel trains make themselves dirty through exhaust fumes, and British Rail’s cleaning regime was diffident at best, especially for provincial trains. Nevertheless, there was still a strong link to the rail blue corporate identity in all these variations. The new InterCity corporate identity was a much more radical break from the standard corporate image. Ironically, British Rail’s corporate identity had been championed by its 1961-1965 chairman Dr Richard Beeching to give the company a modern image to coalesce around, to encourage it to behave in a more modern way, and to look to the future with confidence. 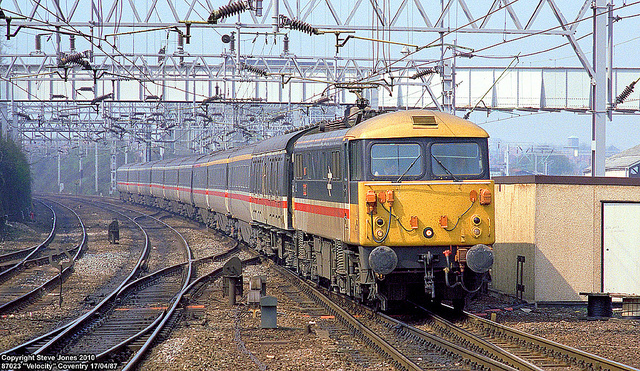 Now the InterCity sector had become so confident that it saw that very same corporate image as a reminder of the past, something it wanted to leave behind along with its associations of drabness and indifferent customer service, not to mention the shocking industrial relations problems and strikes from which British Rail suffered periodically during the rail blue era. These had been particularly bad just before the introduction of the InterCity 125s, when the prototype version of the InterCity 125 and the experimental APT had both been “blacked” by the railway unions who insisted there should be space in the driving cabs for two drivers; one to drive and the other to, er, make the tea, I suppose. Unfortunately, strikes on various issues continued to plague British Rail subsequently, to a greater or lesser extent, but the introduction of a new InterCity corporate identity looked like a chance for a new start. The APT might have proved a failure as a package of technologies, but its new colours spread to the rest of British Rail’s Intercity train fleet from 1983 after a business relaunch. A year earlier British Rail’s Railfreight business had replaced rail blue with dark grey on its locomotives, but at least it replicated the overall form of the corporate livery. More drastic changes to the corporate identity were to follow. In 1986, British Rail reorganised its main business into quasi-independent companies (a process called “sectorisation” if you want the technical term). In 1987, Intercity revised its livery, dropping the double-arrow logo completely, in favour of a swallow logo (a swift would have made more sense, but a swallow it was). 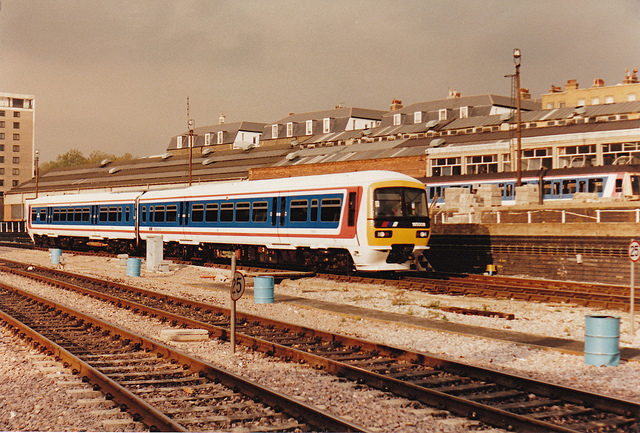 Network SouthEast took over commuter services around London, launching a red, white and blue livery containing a small white version of the double-arrow that was eventually abandoned in favour of a bespoke Network SouthEast logo; a red, white and blue parallelogram. At the start of the process that led to the Network SouthEast identity, director of industrial design at British Railways in the 1980s, James Cousins, wrote (Cousins, 1986: p106), “It is the intention that this initiative should be seen as part of the British Rail’s corporate design today and not as a separate identity.” Whoops. Well, he never claimed to be able to see into the future. ScotRail, meanwhile, adopted a variation of the InterCity colour scheme with a blue stripe instead of red. Railfreight started painting an orange-red band on the bottom of its locomotives, and by this point most of the Passenger Transport Executives in large British cities had started painting trains operating services they sponsored in their own house colours too. It wasn’t just trains. The signage at stations, particularly station nameplates, started gaining stripes of colour relating to the sector which took care of that station. The cohesive corporate identity which had served British Rail so well since the mid-1960s had collapsed, basically because the company had outgrown the need for it. A range of new corporate identities across its business sectors reflected the fact it was better targeting different segments of the transport market: south-east commuters, leisure and business travellers, rural communities, Scottish travellers, freight suppliers and so on. Unlike the early days of British Rail, this was a mix of different identities that actually made sense, because British Rail’s top management understood what the company was trying to do. Sometimes things have fall apart to make way for better things. Out of sectorisation came the greatest British Rail corporate identity of them all, the triple-grey Railfreight colour scheme (which is a story for another time). Although the blue and grey trains of British Rail have long since vanished, Barney’s brilliant double-arrow logo survived being dropped by InterCity and Network SouthEast, and it even survived the privatisation of British Rail, so successful had it proved as lodging in the collective British consciousness as something meaning “railway” in general. Indeed its retention for just this reason was one of the key talking points of the privatisation debate in the late 1990s. It is now the property of the UK government’s secretary of state for transport, who licenses it to National Rail, the organisation which represents Britain’s privatised train operators collectively. 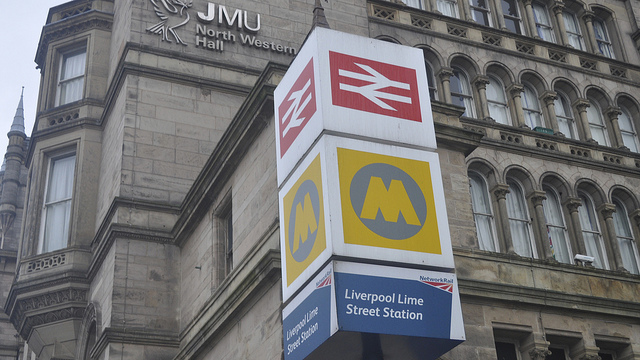 It is used at station entrances, on tickets and on printed publicity such as network maps. The current design guidelines can be found here. The double arrow remains one of the most successful and long-lasting transport logos of them all, standing right up there with London Transport’s blue and red roundel. It also inspired other transport logos both in Britain (for instance the National Bus Company double-N which formed an arrow shape) and abroad, notably the 1968 logo for Dutch national train operator Nederlandse Spoorwegen. Meanwhile, Jens Nielsen, director of design for Danish State Railways in the 1980s said, “British Rail was the guiding spirit and midwife in the creation of better design standards in public transport. What British Rail began is now going on all over the world. Therefore we are all indebted to British Rail as an international leader in railway design.” (Cousins, 1986: p2.) It has to be said that few people ever describe themselves as indebted to British Rail. another fascinating chapter in BR’s history, but no mention of Kenneth Grange, not only the designer of the 125, but also the kodak instamatic the youthful trainspotter would have take the pics of, and the parker pens used to write down the numbers. Heck he even redesigned the taxi and gave us the iconic version of the parking meter! Thank you. 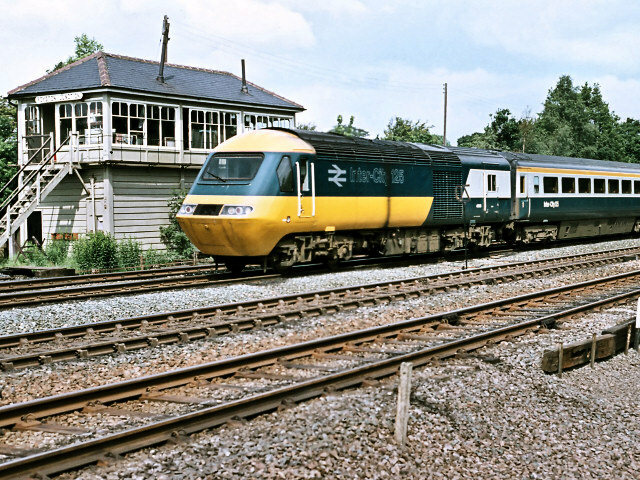 You’re right that I didn’t acknowledge Kenneth Grange as the designer of the IC125’s distinctive exterior look. The article was getting ridiculously long as it was, so I left it at the fact that the IC125 was one of a very few transport vehicles that can be identified by the wider public. I will return to the topic at some point and give Grange the credit he deserves. I’m currently dithering between a series on iconic transport vehicles, including the IC125, or something on Grange’s transport work specifically. Railfreight triple grey livery “a story for another time”? Does that mean an article on it is planned in the future? If so I look forward to reading it – this was probably the classiest of all of the “Sectorisation” era colour schemes, even if intended for the less glamorous business of goods traffic, and certainly the best thought-out given that it worked well on locos of all ages and sizes. 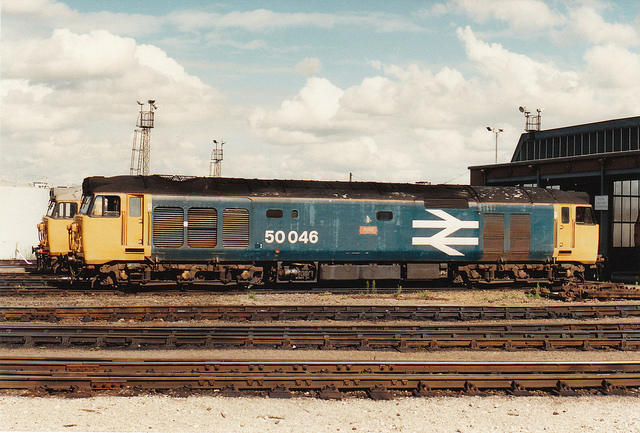 I may be wrong but I’m sure a few locos of classes 60 and 92 are still sporting it even now. Yes, an article on it is planned for the future. As always, it’s a matter of taste, but I’m with you in considering it the classiest sector livery. I think it’s probably one of the best British railway corporate identities of all, to be honest, with an unusual degree of thought going into it and showing through at the end (neither of which are guarantees in the world of railway design/branding). The slate of future articles shifts about a bit, depending on time available in between my paying work (! ), anything topical, and suddenly feeling inspired to write about particular subjects on a whim. That said, the forward plan has an article on Rail Alphabet before the one on Railfreight Triple Grey, as part of the ongoing series of post-nationalisation corporate identity design. But I will get there in the end.